Intended as an action research platform, Public Art Lab devises and implements exhibition and communication formats to take place at the juncture between the creative disciplines, public authorities, the business community and universities. The interventions aim to translate social processes into the public realm with the support of new technologies. Public Art Lab has developed ’action research’ as its preferred methodological tool. Public Art Lab is dedicated to researching and visually communicating diverse locations and their typical social structures at the overlapping layers of the public urban and the digital realm. 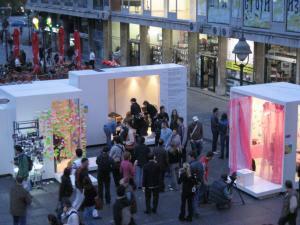 The Media Facades Festivals (2008) and the Mobile Studios (2006) are good instances of this approach. The Media Facades Festivals have encouraged artists and media designers to involve local residents in artistic processes, the results of which are shown on urban screens that are digitally interlinked. The Mobile Studios went on an itinerary through Eastern Europe as nomadic, multi-media research and production laboratory, and observed, analysed and generated various social phenomena. Mobile Studios, in conjunction with co-curating local partner institutions, became the forum for a vibrant scene to express itself in new exhibition formats, and interact with the general public and urban space. Public Art Lab was founded in 2002 by cultural manager and industrial designer Susa Pop and artist Hans J. Wiegner as a network of experts such as curator and multimedia producer Ela Kagel, urban planner Mirjam Struppek, and programmer David Farine, among others. Urban Screens transform the capacity of public spaces to serve as a platform for user-generated civic and cultural expression, community building, multiculturalism and public engagment in issues related to social, cultural and environmental sustainability. Through networking, content sharing and joint broadcasting, they constitute a rapidly expanding and still largely experimental global multimedia infrastructure for commercial and cultural exchange. The International Urban Screens Association (IUSA) aims to inform and support the ‘worldwide Urban Screens movement’: the expanding use of dynamic digital displays in public spaces; their considerate and sustainable integration in the urban landscape; and the ability for screen communities to collaborate in the digital space to share content, experience, ideas, innovations and emerging possibilities. The IUSA website aims to serve as the association’s portal to this growing online community, and provide valuable and accurate online resources covering all aspects of the operation and application of Urban Screens. Facilitated by the association, its development is member-driven and as such represents the interests, expertise and activities of our active members. The Association has been founded in 2008 by Mirjam Struppek and Glenn Harding and launched at the Urban Screens Melbourne Festival in October 2008. Media Architecture Group has been working on an international level on the topic of media architecture and digital media in public space since 2003. Members started collecting media architecture on the very popular blog www.mediaarchitecture.org in 2006. The website has received between 50.000 and 100.000 hits per year. The Group founded in the fall of 2009 the Media Architecture Institute as platform, that sees the contribution in provoking and promoting multifaceted discussion of this topic at an early stage. An open and perpetually growing, interdisciplinary network of architects, light and media designers, artists, engineers, industrial partners and other experts from academic and economic fields has developed from past events. The Collegium Hungaricum Berlin was established in 1924. It re-opened its doors on historical grounds in Berlin-Mitte, Dorotheenstraße 12, with a view on the boulevard “Unter den Linden” in November 2007. The new institute was designed by architect Peter P. Schweger from Hamburg in the style of Neobauhaus and demands for contemporary contents and forms of expression. Over the course of the past two years the .CHB has emerged as an excellent centre for art and media within the cultural landscape of Berlin-Mitte. 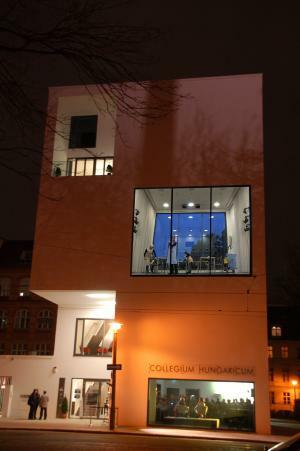 Since 2008 Collegium Hungaricum Berlin has been hosting projects on the intersection of art, science and research utilizing its unique Panorama window with rear projection facilities to communicate with the city space.